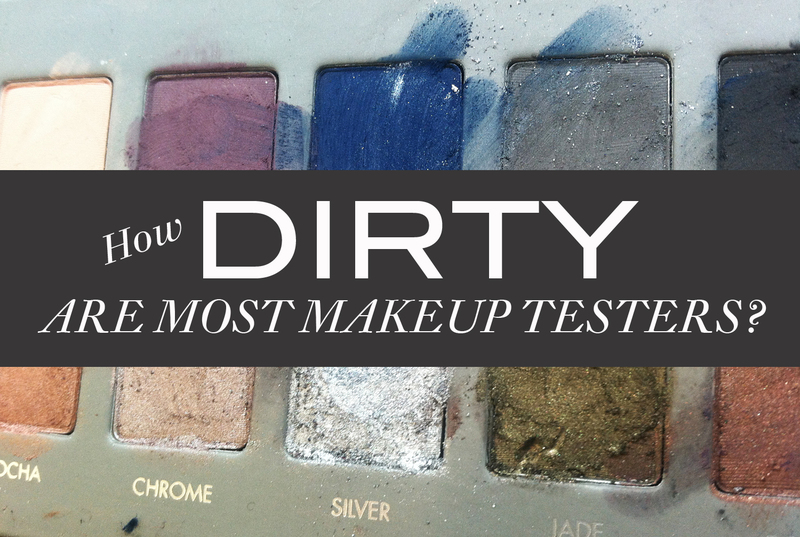 Confessions From the Makeup Counter - how dirty are most makeup testers? Imagine one day you're wandering the aisles of your local natural health food store. You've got your coconut water, Brussels sprouts, trail mix and a chocolate bar flavored with 3 different exotic fruits and sea salt . In your journey of sight, sound, and snacks you happen to meander into the bodycare section and notice that, hooray, your local store has begun stocking makeup! And as is the way with impulse purchases you remember that the tube of your favorite lip color in your purse is indeed getting low. Your hand starts to move toward the line of testers which are conveniently left open for you to try. You're thinking maybe you'll give that more intense red a try this time.... and PAUSE. This scene could be played out with in your local beauty superstore (sans Brussels sprouts) or perhaps your cosmetic stomping ground is at the department store. No matter which venue you shop the reality is that the testers in all these locations have been touched by dozens or potentially even hundreds of people. Human hands are major sources of contamination and the skin of all the strangers that came before you may have been a harbor for microbes that could be problematic for your health. Staph bacteria and even E. Coli could be tagging along for the ride. These are pathogens that can create a serious skin or eye infection depending on each person's unique vulnerabilities, so it's worth it to consider how well the location you're at is sanitizing their testers, if they sanitize at all. Many simply do nothing and in doing so they let the germy good times roll. We talk a lot about toxin buildup on this blog, but the makeup tester type of contamination is a whole other can of worms. 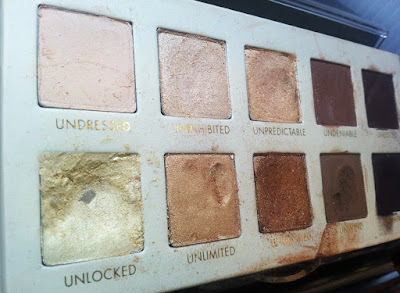 Most makeup has some level of preservatives in it, especially if it has any moisture content at all, but any preservative system (even the synthetic ones) can get overwhelmed in the right situation. Having a preservative doesn't mean the product can kill anything. It's made to hold up to normal, everyday use. In most cases that would mean one person possibly touching it once a day, not the onslaught of dozens of users that a big store might bring on in a single day. In a 1994 study in the Journal of Industrial Microbiology a total of 3027 shared-use cosmetic product samples were collected from 171 retail establishments throughout the United States. Their analysis showed significant contamination in 50% of the samples taken, with average densities of "2288, 1685 and 1088 CFU [per gram] for face and lip products, respectively." The legal limit in the USA set by the FDA is 1000 Colony Forming Units per gram with a lower limit of 500 CFU per gram for eye area products. Numbers alone are not enough to judge, though, and a product could be deemed contaminated beyond acceptable use if a dangerous pathogen may be present - in other words a microbe that could harm that particular area of the body. The eyes are particularly sensitive areas, and eye infections are a very possible result of contaminated tester usage. Pinkeye is not a cute color on anyone, and certainly not what you want to be sporting after a few mindless moments at the makeup counter. The extensive testing quoted above shows the eye products were some of the most contaminated products. More than 60% of the microbes found on makeup testers were typical specimens of microflora from human skin, meaning the contamination was the direct result of being touched repeatedly. The remainder were environmental microbes from the items sitting out for long periods of time. The air can carry yeast, mold, and sneezes from the toddler who came along on the shopping trip. The sad fact is that most mass market locations have no substantial sanitation practices. Employees are busy stocking shelves, taking inventory, or occasionally helping with product selection. Sanitation takes a big back seat, and in many cases it would be nearly impossible to keep up. Of the 5 people browsing the makeup section at the superstore at any given time the service staff can only help one while the other shoppers may be dipping and smearing their way through the tester stock the entire time. The contamination goes up the more people shop at that location, even if employees are scraping the tops of products and following good hygiene protocol such as at department stores where there are more staff devoted to dealing with the products. They just can't fight the flood of customers coming through, and while they're tending to someone's makeover a thoughtless shopper is rubbing their fingers on the blush. They may not see or have time to deal with it before the next person comes by and does the same. In an article by Prevention magazine testing showed that on weekends, when stores have the heaviest traffic, up to 100% of the testers showed contamination. Your eyesight alone is not enough to be able to judge if an item is clean. You see pretty colors that might look great on your next night out, but it takes a microscope to see microbial contamination. An eyeshadow that looks like a crater may look visually unappetizing, but one that only looks a little smudged can be just as problematic from a bacterial standpoint. When we opened Blissoma Botanical Beauty last fall and began stocking makeup I was happier than ever to have our Staff Esthetician Lauren on board to advise us about proper care of our testers. She's fantastic with skin consultations, but she's also a former makeup counter employee and had a backstage view of the good and bad sanitation practices used in other environments. With her we devised appropriate protocols for disinfection of testers and brushes after use to protect our clients. Single use swabs are available throughout our space, and every client is assisted with testing products. Since we are generally serving one client at a time we can supervise the and often apply products for the client, meaning no sneaky fingers in our testers. That keeps everyone safe. We use organic alcohol liberally in cleansing brushes and surfaces as needed, and are in a position to discard a tester if we feel it has become questionable. Products in jars are sampled with a Q-tip, not with fingers, and any items meant for testing are stored closed to prevent infiltration by environmental contaminants such as airborne spores and germs from coughs and sneezes. These measures make a low traffic, high service environment like ours that is staffed with trained professionals the best and safest place to test makeup. Lauren's attention to quality care for her clients is a big reason she fits in at Blissoma. She wrote a bit for us about her experiences with sanitation and provided some tips on what you can do to keep yourself safe the next time you go shopping. Believe it or not there people who seek out a meticulous level of understanding of sanitation in the beauty industry. These people want to ascertain everything from how long fingernail length should be to which direction you should wipe a cotton swab after extracting a blemish. (It’s down, by the way.) These people are called estheticians and they spend months, some even years, studying skincare techniques, makeup application and the sanitation protocols for both. Estheticians are also handy to have around when looking for more information on what procedures should be in place for a spa or retail boutique that sells makeup and skincare. I am currently a licensed esthetician but before I decided to pursue this career I got my start working at a makeup counter. After working at the department store for about a year I decided that I wanted to learn more. I had gotten a glimpse of the makeup world through retail but I knew that if I wanted to take this seriously I would have to become certified. I set out for my esthetics license and passed my boards in 2011. It was in school I learned proper safety and sanitation procedures. Unfortunately I’ve also experienced several working environments where protocols start to lag. With the busy pace of business staff can feel rushed, learn new habits, and pay less attention to the sanitation procedures they originally learned. In some cases employees may never have learned them in the first place. Cosmetics locations besides spas and salons may not hire people with an esthetics or cosmetology license to sell for them.That is not necessarily a bad thing if they still follow the same codes as licensed workers, but then as a consumer you are just leaving it up to good faith that they somehow have learned those codes from their place of employment. At places like natural grocers that have makeup sections with testers and even at department store makeup counters there tends to be more foot traffic and more ways that germs and infections can spread through shared testers. Many of the retail workers I worked with at the department store cleaned the makeup brushes on a daily basis and tried as much as they could to discourage people sticking their fingers on and in products. Instead they would encouraged the use of disposable tools. On the other hand some makeup counters did not. The result is harmful to customers and to sales of products, as infections damages trust and causes customers to avoid trying the very products cosmetics companies are trying to demonstrate to them. Accidents and mistakes do happen but I am confident in my role here at Blissoma. Because we are independent we can spend more time with customers when they come in because there is no sales goal we have to hit hanging over our heads. We also have time to properly clean tools after consults, which makes a big difference in preventing the spread of microbes between makeup products and people. The proper and frequent cleaning of brushes is a topic that all makeup artists should know well, and can be a problem area in some professional environments. I remember many times running out of brush cleaner at the department store and either going to other makeup counters and begging to use theirs or having to spray off a brush with water mixed with liquid soap and hope it got the job done. Makeup brush cleaner was treated like gold there. No one ever wanted to share it because it was rare to get more since each individual company was to supply their counter with their own. If the counter manager forgot to order more or the company decided that you get an allotted amount per a certain time period and then you run out before receiving more…well, it was up to us to figure it out. 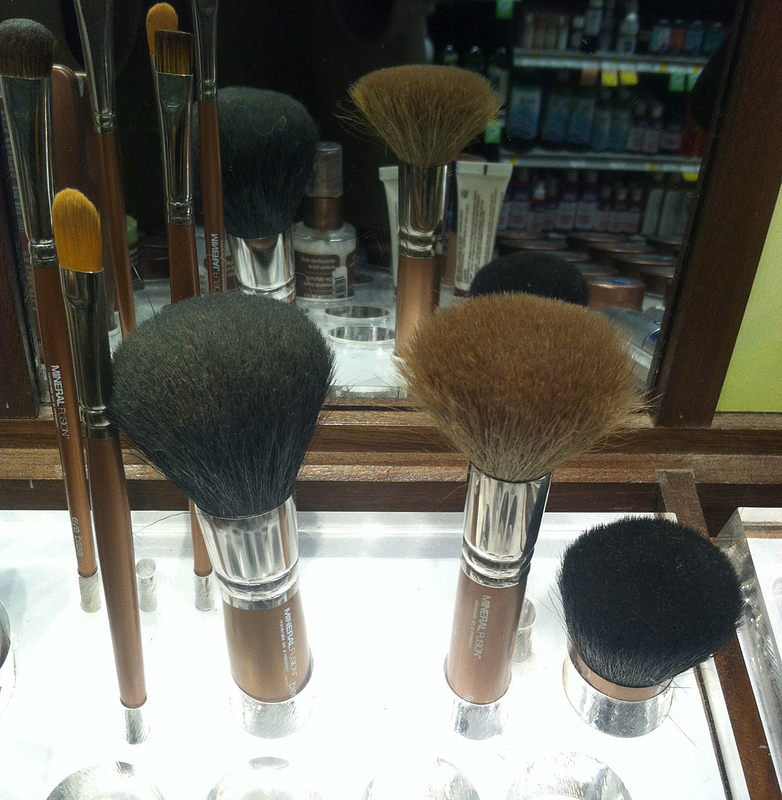 I really like that at the Blissoma store I have complete access to our makeup brush cleansers and can refill them whenever I need to. We use organic alcohol to disinfect brushes as a quick cleaning, and then wash brushes on a regular schedule or after any particularly heavy use. The type of makeup being sold can also have a big impact on whether or not testers may be contaminated. Mineral makeup composed simply of milled earth-mined pigments makes it harder for bacteria to flourish. 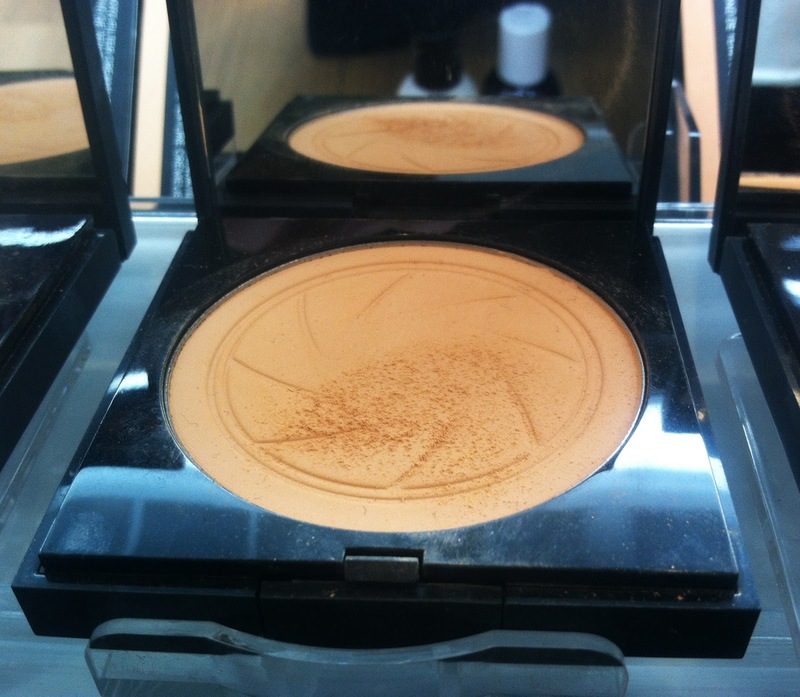 There is no moisture or oil in a powder based mineral makeup, and that is the food on which microbes live. Pressed eyeshadows, blushes, and powders are much more likely to harbor pathogens because there is some type of binder always used to make the colors adhere into the pressed shape. Now, in no way am I trying to put down anyone who works at a makeup counter at a department store. This was one particular place at one mall in the state of Missouri. It was my experience and it was part of the reason that led me to wanting to learn more and become certified in what I do. There are many passionate makeup artists and skincare sales people out there that don't have a license and are still able to use common sense when it comes to sanitary practices and get the job done. I remain glad for my training, though, as it allows me to be confident that I am taking the best possible care of my clients. The bottom line will never come before being able to take some time out to properly sanitize my space before starting on my next makeup or skincare consult and that is good for me and for you! Make sure whoever you are working with washes their hands or uses a hand sanitizer before touching you. If they don’t, you can always say you have just gotten over a cold and would like them to sanitize their hands before starting so you can avoid catching another while your immune system is sensitive. Look for accessible disposable tools like mascara wands, lip wands, q-tips, sponges and cotton balls - anything that can be thrown away after one use. Make sure they do not double dip with said disposable tool. You cannot stop the general public from doing this but the person that is there to assist you should not re-use something made to be thrown away after one use. Make sure they spray their non disposable tools with some type of brush cleanser before using on you. Typically I would trust there is something in there that will properly sanitize a brush after each use but if you feel inclined it is not odd to ask what they use to do this. Brushes should never look gunky, though sometimes, especially if it is during a busy day, you may see powder residue on some brushes but that should be easily wiped away by a spray on brush cleanser before use. Most places do wash their brushes with a gentle soap and water but this is typically done at the closing of the day because they don't dry fast enough to use again and need to dry over night. Products packaged in bottles with pump dispensers or in squeeze tubes will be the least likely to be contaminated. They do not sit open to the air and fingers are kept out. You can feel much more confident about testing products in this type of packaging because the packaging itself protects the product. 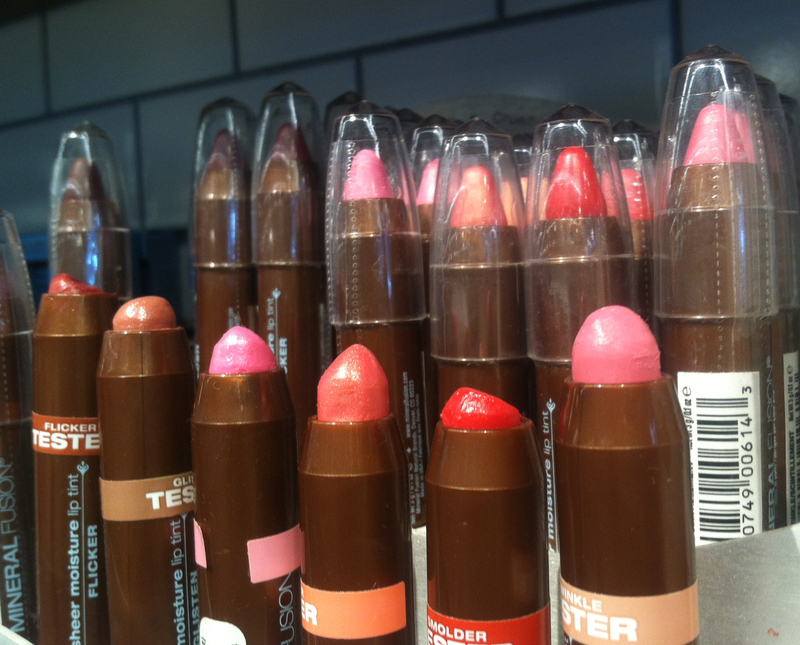 Be far more careful about products in jars, pressed powders and eyeshadows, and, of course, lipsticks and glosses. In general always go with your gut feeling. If something looks used up, crusty or not well taken care of you can always pass on trying it. Never feel like you are being too picky. Many women have a hard time with this and don't want to ruffle anyone's feathers especially in a light hearted situation where you may find the person you are working with quite pleasant and don't want to offend them. In such a situation I would pull from my story above about the women who would not let me put the eye makeup on her. As soon as she told me she had a bad experience with an eye infection due to being in the exact same situation I immediately understood and did not push any further. If able, shop at a smaller business that staffs trained and optimally licensed beauty professionals. The more personal their approach and the more training they have the more likely they are to follow proper sanitation procedures. You can also observe the employees working before having any makeup applied. If you observe them sterilizing tools, pencils, and other products before reuse you may feel more confident. If you do not have a cosmetics retailer near you that you feel you can trust then you can elect not to use store testers in your shopping process at all. Simply inquire about the return policy for that store and purchase unopened product. Save your receipt and return it in a timely fashion if you are dissatisfied. Good sanitation procedures never go out of style, these are some tips you can always use. If you feel inclined to question just do so. If there is nothing to hide people will be happy to explain what they use to make sure you are safe and feel comfortable. Note: All images for this post were taken at my local natural grocer and the beauty superstore in the shopping center nearby. 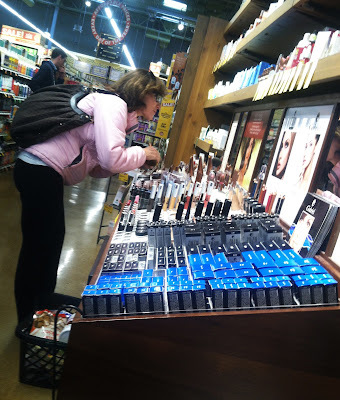 These are the real conditions of the makeup testers on display every day, and despite availability of employees in the aisles there was no routine maintenance or sanitation occurring in either location at the time of the visit despite shoppers actively interacting with testers. About 16 years ago, my friend's parents owned a clothing store in Downtown Los Angeles. We were both young adults at the time & when his schedule allowed he helped his parents at the shop. They had a Mary Kay cosmetics counter in the store, by the entrance, & women who were interested in testing foundation would stop by the counter. Once, I observed as my friend handed them the tester bottles & they then poured the foundation onto their fingers or hands. They rubbed the make-up on their skin & reached for the bottle again if they wanted more. As soon as the group of women had left I adviced my friend not to let customers handle the tester bottles. I suggested he pour a small amount of the foundation onto a paper napkin that he could could then hand a customer. I told him it would be safer to test foundation in this manner. He didn't know, he said, that the way the foundation was being handled was problematic. Many times, I think, people don't give a second thought to the safety of something typical or standard such as cosmetic testers in a cosmetics store or counter. what a brilliant post. I always get spooked by stuff like "testers" than could be potentially filled with germs. I only ever swatch on my hands to get an idea of color against my skin toner, but I always use their sanitizer and remover right after. It's crazy how much we don't think about all the hands touching all these little testers. Thanks for this read!